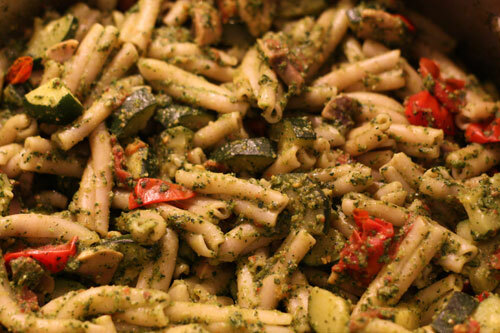 When you talk about pesto, most people immediately think of the delicious, garlicky concoction made with fresh basil leaves, pine nuts, olive oil and parmesan. 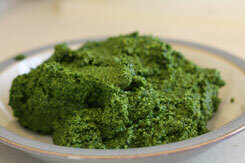 Pesto is fresh tasting, and best to make in the summer when fresh basil is easy to come by. Over the last few years I’ve discovered a love for pesto made from a variety of different leafy greens, including dandelion and arugula, as well as with fresh ramps (wild leeks) and garlic scapes (the curly green flowering stems removed from the bulb). This version is also quite yummy and uses some pretty basic and accessible ingredients. Kale can be found in abundance all winter long, and raw pumpkin seeds are available in bulk food stores, the bulk section of most supermarkets and in health food stores. You will need a food processor, or at the very least a mini prep to get the best results, although those with a vita mix will also have good results. Feel free to try this with your blender, though I’m not sure it will work quite as well. By using kale and pumpkin seeds along with the usual olive oil, this pesto becomes a superfood in its own right. Kale is a versatile leafy green member of the cruciferous (cabbage) family. It is a nutritional superstar and is an excellent source of carotenes, manganese, vitamins C and B6. It has extremely high levels of chlorophyll and is a good source of fibre. As with other members of the cabbage family, kale has been shown to exhibit many anticancer properties. Pumpkin seeds are also known as pepitas. They are a source of many minerals, including iron, manganese, copper, and phosphorous. Their high zinc, EFA and phytosterol (particularly beta-sitosterol) content make them a valuable food to include for men suffering from or wishing to prevent prostate enlargement. Garlic is a well-known medicinal plant with a wide variety of therapeutic effects. It contains high levels of many sulfur-containing compounds, as well as high concentrations of many trace minerals. Chopping or crushing fresh garlic is what turns garlic into nutritional powerhouse. Get creative – this versatile spread doesn’t have to just be tossed with pasta. Why not mix it in with some cooked potatoes for a delicious warm potato salad? You could also use it as a spread on some crackers or garnish a nice bowl of soup. Step 1 – Wash kale leaves well. Remove leaves from tough stem and tear into smaller pieces. Step 2 – Toast pumpkin seeds in a pan over medium heat. Stir frequently and don’t leave them as they can burn quickly. Once they are a lightly toasted and fragrant remove from heat. 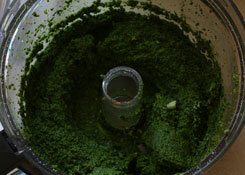 Step 3 – Add kale leaves and pumpkin seeds to your food processor. Pulse until finely minced, scraping down the sides frequently. Add crushed garlic and parmesan cheese (if using) and pulse to combine. Step 4 – Turn machine on low and slowly add olive oil. Let run until well combine, scraping down sides of machine ocassionally. Add lemon juice and sea salt, pulse a few more times to combine, and you’re done! Pesto freezes beautifully, so don’t feel like you need to use it all at once. A little goes a long way. I like to freeze mine in an ice cube tray and then keep it in a Ziploc bag so it’s easy to grab a small amount to add to things. I tossed my last batch with some spelt pasta, zucchini, mushrooms, and grape tomatoes for a simple supper the other night.